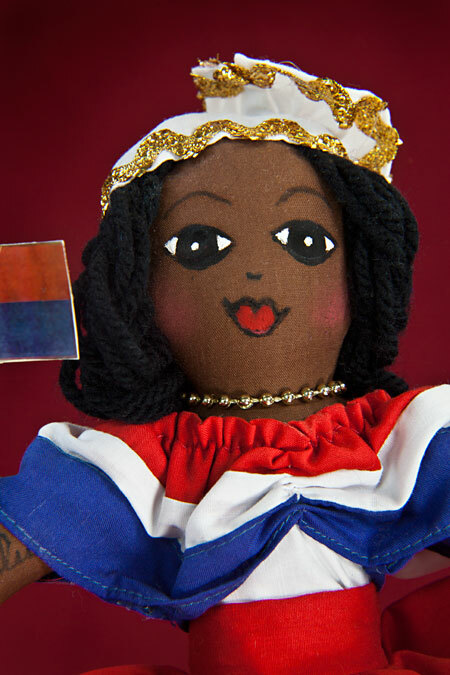 Handcrafted doll of woman in St. (Sint) Maarten who is holding the country’s red, white and blue flag. 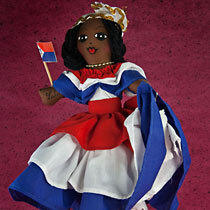 She is created with stuffed cotton material, and is wearing a dress made of red, white and blue ruffles. She has black slippers on her feet with a small rhinestone button. 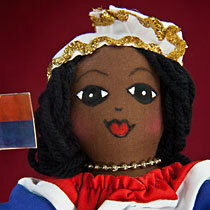 Her face is painted on the fabric, and she a white cap, trimmed with gold, on her hair made of black yarn. 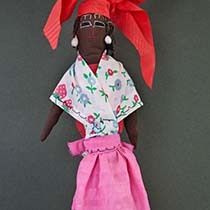 She is wearing a necklace made of silver beads. She is standing on a wooden platform, that says “St. 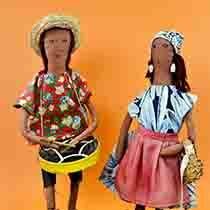 Maarten, Netherland Antilles.” Tag:” Lulu’s Dolls. 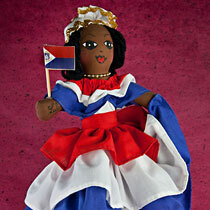 Handmade at Gift World , 21 Frontstreet, Philipsburg, St. Maarten, Neth. 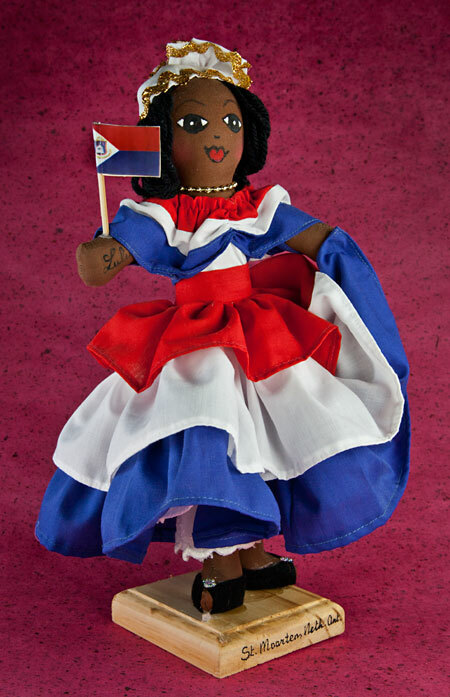 Antilles.” The arm of the doll is signed by Lulu. 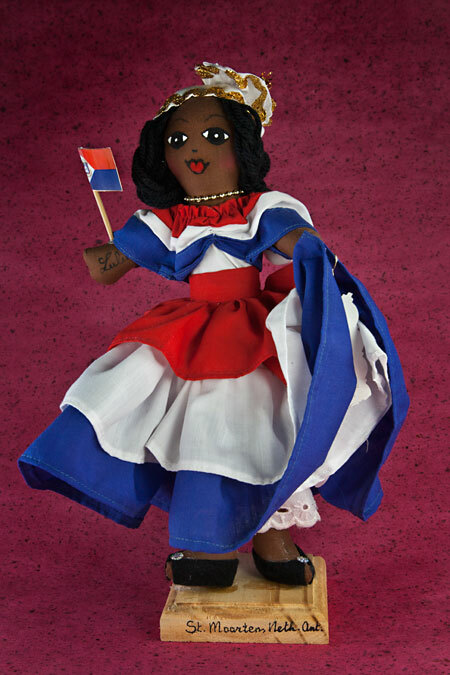 To learn more about the culture of St. Maarten, read the story. My name is Regina and I live on an island in the Caribbean. 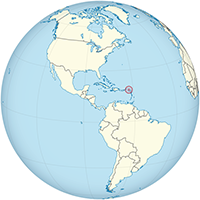 The island is half Dutch (Sint Maarten) and half French (Saint Martin). It’s a very small island, and the Dutch and French people are all very friendly. We have beautiful beaches, good food, and warm weather. Lots of tourists come to visit via cruise ships and airplanes. Many years ago, the Spanish, Dutch, and French fought to rule this island. Finally, in 1648, the Spanish left. Then, the Dutch and French agreed to stop fighting and share the island. However, they couldn’t agree about how to divide the island. The legend suggests they decided to have a race to determine the borders. Early one morning, everyone went to Oyster Pond (a small town on the east coast). There, a Frenchman and a Dutchman stood back to back. The Frenchman faced the north, and the Dutchman faced the south. When the gun fired, they both started running as fast as they could. The idea was that they would run along the coast (in opposite directions). Wherever they met would be the dividing line for the border. As it turned out, the Frenchman ran a lot further than the Dutchman. That’s why the French ended up with more land (21 square miles) than the Dutch (16 square miles). There are many tales about why there is such a big difference. Some say the Dutchman drank too much gin and stopped to take a nap. Others say the French had a big Navy ship off the coast to scare the Dutch. In any case, the French “half” has always been a little bigger than the Dutch side. It doesn’t really matter though; we all get along just fine. The border is open and everyone passes freely from one side to the other. The tourists love being able to visit two countries for the price of one!